If you are planning to replace the floor of your office with some suitable flooring option then many flooring options may come into your mind like the owner of any other property in your area. Though you can find various types of floorings in the market but while choosing for your office you will have to consider certain things including the amount of average traffic in it. Usually offices have medium to high traffic. So you should choose flooring that can survive in medium to high traffic without requiring frequent repair and replacement as it is not inexpensive to repair or replace it frequently. So for this reason laminate flooring is considered as the best office flooring options due to various reasons, briefly discussed here under. Cost effective: It is one of the major factors to be considered while buying flooring for an office. Most of the owners of commercial as well as residential properties may find laminate flooring within their budget as its initial installation cost is very reasonable as compared to other flooring options. Moreover the cost of maintenance of this flooring type is also very low as you can easy get rid of dust and dirt and other debris just by vacuuming or cleaning it regularly. Durability: Second major reason of using laminate flooring in office is its durability as it does not show signs of wear and tear for many years at a stretch. This flooring is available in different thicknesses consisting of different number of layers from which you can choose as per your requirement. Laminate flooring with 4 layers is considered as most suitable for offices and commercial areas. 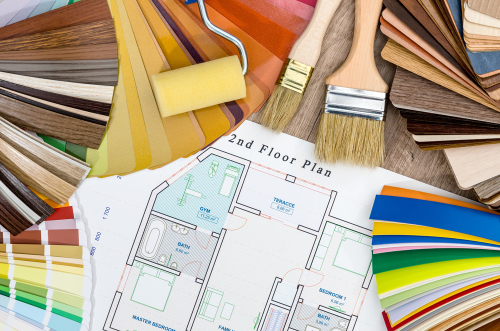 So you can keep your office in good condition for long time by choosing flooring as per the amount of traffic in it. Easy to use: The top layer of laminate floors is designed to be cleaned very easily as you can get rid of dust particles and debris just by mopping or wiping them with a cloth. Moreover it is highly resistant to stains. On the other hand its installation is also very easy as neither it needs several materials for its installation nor they take much time to dry up. You can cover up the floor area of your office within few days by hiring some professional flooring service. Variety: You can find different types of laminate flooring in different designs and colours in the market. The materials used in it are printed in sunlight in different designs and colours to allow you to choose as per the suitability with your place and your preferences. They are available in wide range of designs including flowered patterns to the patterns with hardwood finish. They are able to survive general wear and tear, abrasions and stains due to their different types of top layer. So you can choose this flooring according to the level of activities and amount of general traffic in your office. Friendly to UV Light: Laminate flooring can survive the exposure to UV rays and sunlight to a great extent. It does not fade away like several other flooring options even if it is continuously exposed to UV rays. For this reason it can ideally be used outdoors along with offices and shops. Thus according to the reasons discussed in this write-up laminate flooring is ideal for using in all types, from medium to high traffic, of offices. They are the best flooring option of the offices because they are available in large variety, need minimum maintenance and long lasting. In order to ensure their long life you will have to clean it regularly as accumulation of abrasive debris can damage their top layer regardless of their quality. Accumulated debris can wear of its top layer, which is protecting its decorative design, if not cleaned for long time. It can be cleaned up easily just by using a mop with basic cleaning materials. In order to ensure durability of laminate flooring it should be installed properly as any compromise can be hazardous even for the flooring of the best quality. You should engage experienced flooring service provider to install laminate floors in your office. The owners of the office will have to bear various types of additional costs if the flooring service does not guarantee proper installation of floors. But you should be careful especially while selecting the suitable laminate flooring for your office. Some tips are provided here under that can help you in determining the quality of laminate floors suitable for your place. Check the grade of the laminate floors: Laminate floorings are graded in three categories including good, better and the best according to the quality of materials used in them. The price of these floorings varies with their grade. But you can consider some other factors while choosing suitable laminate floors if your budget is limited in this regard. Check the floor’s finish: The laminate flooring you choose for your office should be evenly aligned. Any unevenness or gap in the flooring will not allow its proper installation. If the flooring provides a flawlessly flat surface then it can be of good quality for you. Check the patterns of the floors: The quality of laminate floors may not be good for you if its patterns do not provide a natural and smooth look. The quality of flooring degrades if its patterns are repeated frequently. 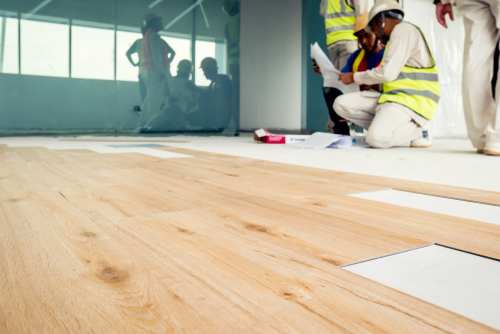 Check UV compatibility and ISO rating of floors: You can ensure good quality and durability of laminate floors on the basis of their UV compatibility and ISO ratings. Floors with good rating and UV compatibility can last for long time. Ask for the process of making the flooring: High pressure and direct methods are used for making Laminate floorings of different types. Though the quality of laminate floors made from both the methods is good but high pressure method is the latest technique of making high quality floorings these days. Thus you can choose the best quality laminate floorings for your office by following the tips provided in this write-up. 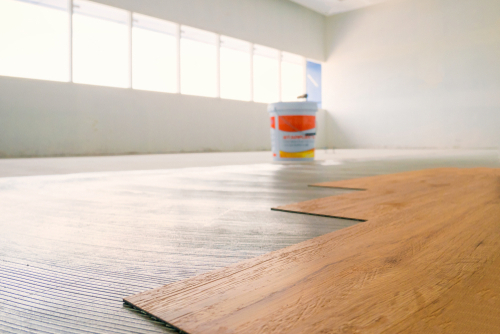 In order to ensure their long lasting service you should hire an experienced flooring service for their proper installation. You should clean it regularly to maintain it for long time at lowest cost.